Paige Heesch hugs her mom Brenda. 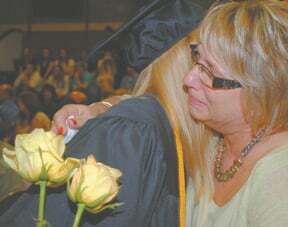 CRYSTAL LAKE - May 20 marked the end of an era for students at Woden-Crystal Lake-Titonka High School. As W-CL-T students, faculty and staff gathered for graduation in the school's gymnasium, it would be the last time they would do so as one unit before going their separate ways. The ceremony marked the final graduation at W-CL-T, and even underclassmen would be saying their goodbyes as the two districts have sharing agreements with Forest City and Algona. "Tonight is an exciting highlight in our school's history," said Valedictorian Abby Sexton. "It is a graduation that is bound to be remembered for years to come." It was a time of reflection for many seniors as they laughed and cried together while recalling the 13 years of memories made as classmates and friends. Class speaker Hannah Kofron reflected on the years she spent at W-CL-T and mentioned one individual characteristic she would remember about each of her 28 fellow graduates. "Each classmate has given me some inspiration or a new appreciation for life," Kofron said. "We are who we are today because of a steady foundation built by our friends. This is the end of many chapters; the end of an era. Tonight we say goodbye to teachers and administrators and the school that has held our sweat and our tears, our successes and our failures, and the underclassmen will as well." Graduates Tommy Schutter and Kyle Pals reflected on 13 years of memories by recalling various events that had taken place over their school years from kindergarten nap times to elementary school "marriages". Laughter filled the gymnasium, breaking the silent bittersweet emotions for just a few moments. "Today is a bittersweet day," Erika Withers said in her farewell speech. "It marks the last day of Woden-Crystal Lake-Titonka as a complete unit. We are the last to graduate from here and others won't be able to share that title." Following Withers' speech, students tossed their caps in the air and joined the the W-CL-T alumni family.